[AS3] When I load local movie file, security error has occured. I usually develop flash content with Flash Builder. First I output the swc file from Flash CS 5 application. And then, I import it from FB. And I compile it to swf. I tried to load the movie file in local file system. But an Error dialog has been appeared. SecurityError: Error #2148: SWF file file:///Users/kinkuma/Documents/temp/main.swf cannot access local resource ./video/samplef4v.f4v. 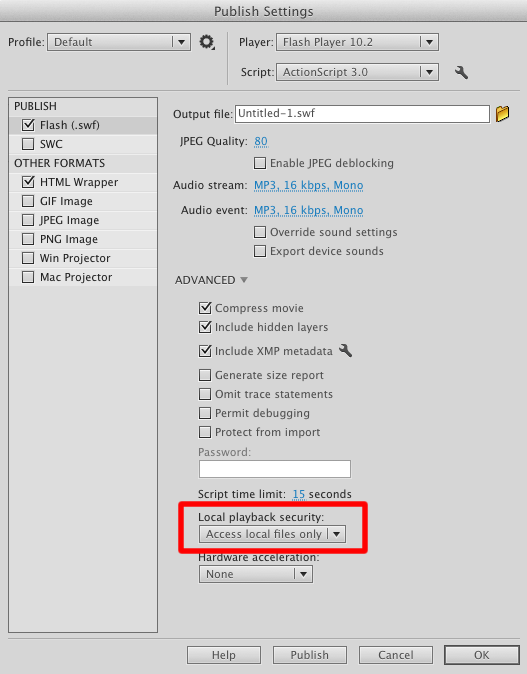 Only local-with-filesystem and trusted local SWF files may access local resources. I googled it. And I found how to solve it. It says I have to add the compiler settings. 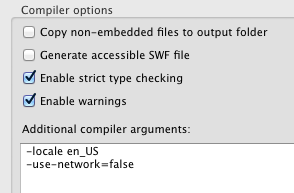 If you load external swf files, you have to make all swf files same network policy. You can select the above settings with Flash Application. 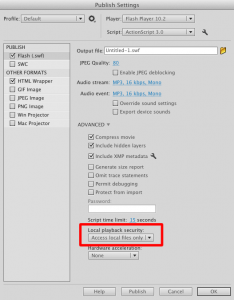 Posted in ActionScript3 | Comments Off on [AS3] When I load local movie file, security error has occured.